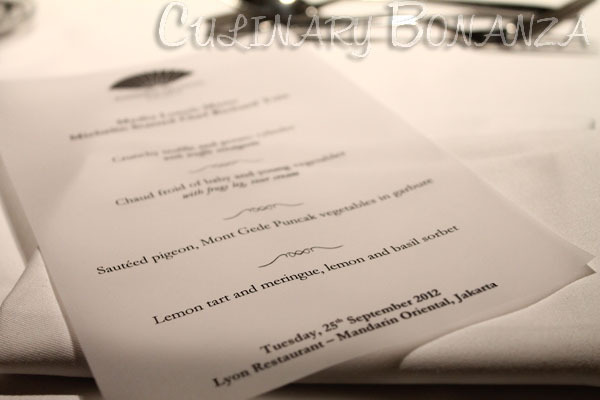 The lunch invitation extended by Mandarin Oriental Jakarta a few weeks ago had been my debut in Michelin starred dining experience. Just like any first moments in our lives, I didn't quite know what to expect. But I knew that not just any chefs would be rewarded with the much-coveted Michelin Star, a prestigious award often perceived as the epitome of a chef's or a restaurant's achievement in the culinary world. 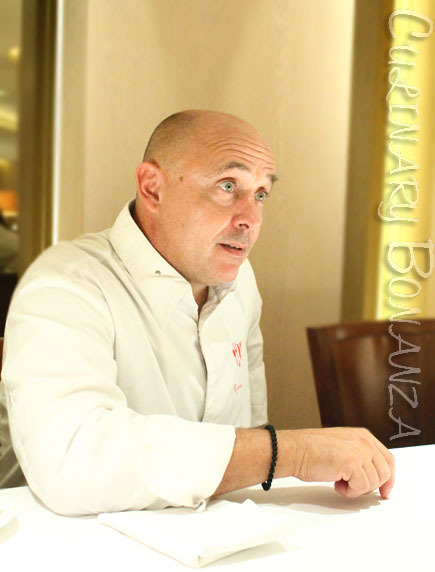 With over 20 years’ of culinary experience, coupled with his great enthusiasm for French cuisine, Chef Richard opened a fine dining restaurant “Passions & Gourmandises” in the charming village of St. Benedict. His interpretation of “oysters and shallots” bewitched the Michelin inspector and led the restaurant to receive its first star in 2008, just nine months after opening. The theme that Richard Toix presented at Mandarin Oriental Jakarta during his short presentation from 27-29th September was "Flavours of Art". I was prepared to be unprepared for what was about to be served. 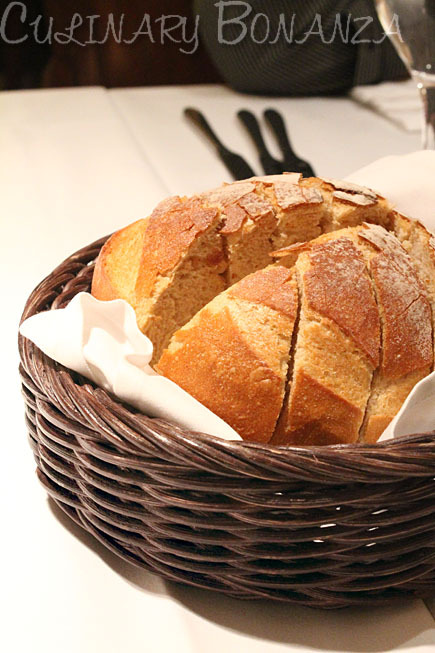 The starter was a basket of freshly baked, still piping hot sourdough. The crust was crispy on the outside but fluffy and chewy inside. Sourdough is raised using naturally occurring yeasts & lactobacilli in a long fermentation process, which leaves lactic acid as a by-product. The acid is still present even after baking, thus giving the slightly sour taste. The bread tasted amazing even without butter. 1st dish: Crunchy Truffle and Potato Cylinder with Truffle Vinaigrette. From bird's eye view, the duo-tone dish looks reminiscent of an eclipse. The delicate potato foam and bits of raw black truffles were contained within an immaculately round, crispy & paper-thin potato paste. Right after the first scoop, my entire head was eclipsed with the memory of when the rich and earthy aroma erupted in my mouth. 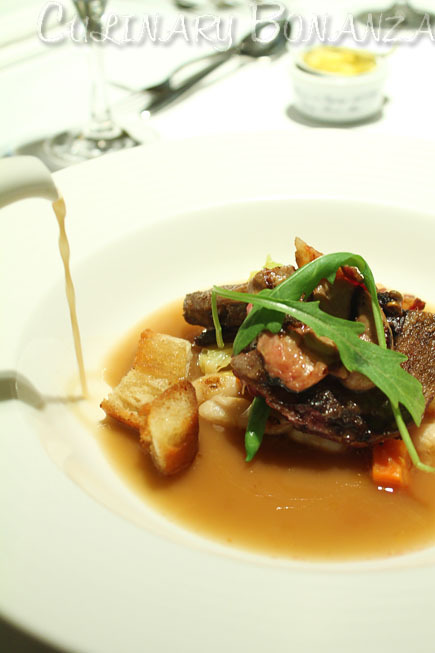 The first dish was so light & delectable that given the chance, I would've opted for a second helping. 2nd dish: Chaud Froid of Baby & Young Vegetables with Frog Legs & Sour Cream. Chaud froid in French literally translates as 'hot cold', which described the second dish perfectly, as it was a playful combination of fried frog legs and the cold sour cream topped with a colourful bouquet of flower & baby vegetables This edible art installation was so endearing to they eyes, it's almost a shame I had to destroy it with my cutleries. The fried frog legs has tender texture which is comparable to chicken and although it was supposed to be the highlight, I found more pleasure nibbling at the baby carrots, zucchinis and beetroots. Garbure is a classic French soup or stew, traditionally made of ham and vegetables, although the combination could vary from one region to another. To begin with, as the garbure was being poured from a tea pot, the odour was inexplicably off-putting for me. As I tried to figure out what it reminded me of, I recalled the chicken liver that used to be my dog's favourite food. The sauteed pigeon was cooked to medium that when my fork tore at it, blood and juices still covered the partially raw flesh. Such a shame that I simply don't have the guts to make myself ingest anything bloody, so apart from the vegetables and garlic croutons, I left the rest almost intact. After a fleeting encounter with the main course, a refreshing dessert is called for to overcome the savoury sensations in the mouth from the previous dishes. 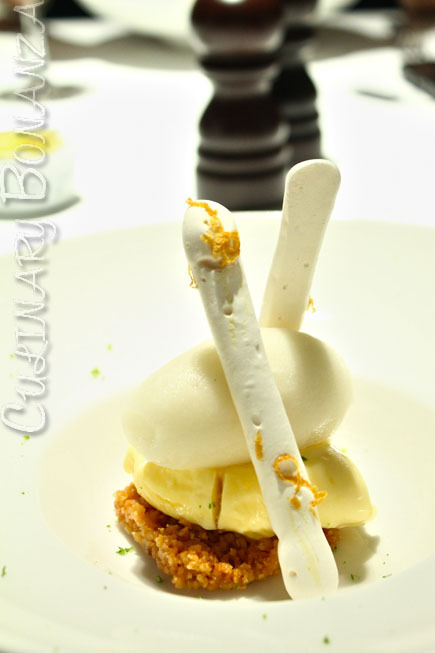 The Lemon Tart & Meringue with Lemon & Basil Sorbet was literally an eye-opening dénouement to the aesthetic play. The lemon butter and the lemon-basil sorbet tasted sharply acidic, but the sweet and crisp lemon meringue and the tart at the base balanced it delicately. 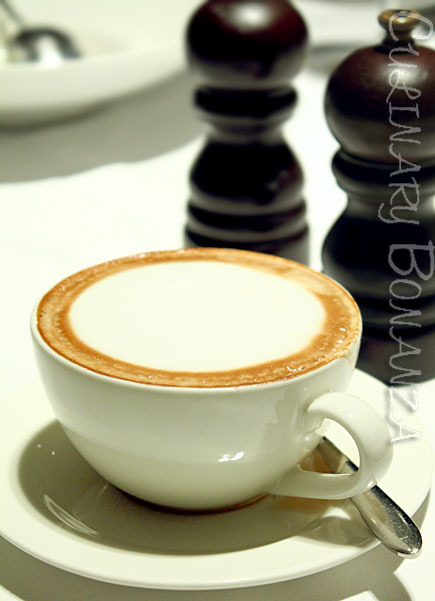 Alas, while waiting for Chef Richard to come up and join us at the table, I requested for a cup of cappuccino. Voila, c'est un bon café! On a last, note, I'd like to thank Mandarin Oriental Jakarta for the kind invitation extended to me. 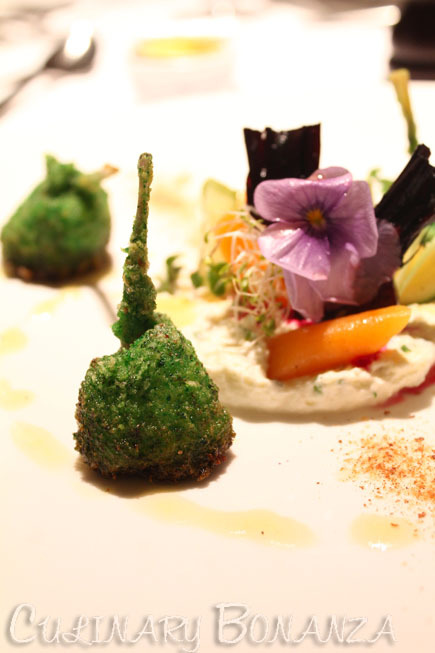 I certainly look forward to other gastronomic indulgences by Mandarin Oriental, still to come in the future. For those who prefer to have an up-close dining experience with Chef Richard, can join the Chef’s Table with a minimum of four and maximum of 6 people and priced at IDR2,588,000++, or sign up for a cooking demo price at IDR988,000++.